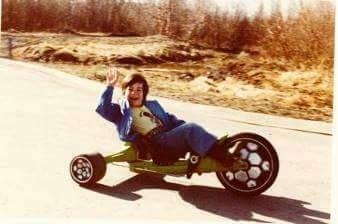 Freddy Beans reviews the documentary KEN FOSTER. 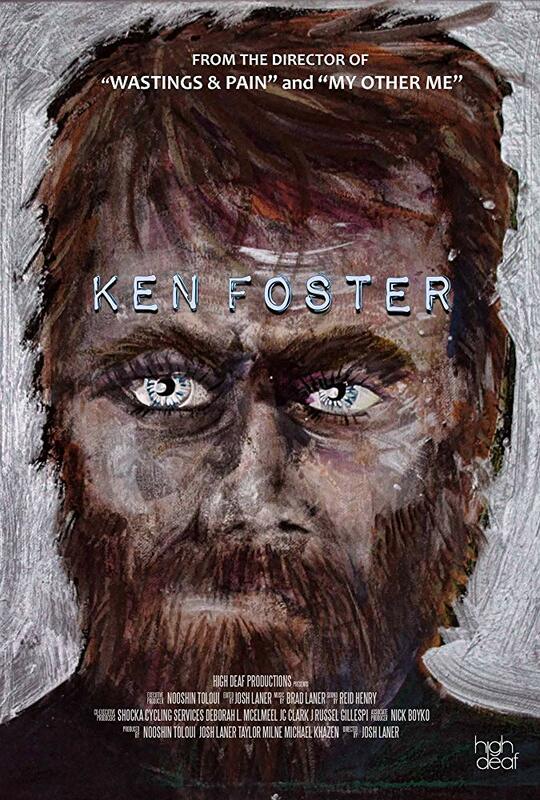 Freddy Beans here, with a review of an absolutely captivating documentary titled KEN FOSTER. 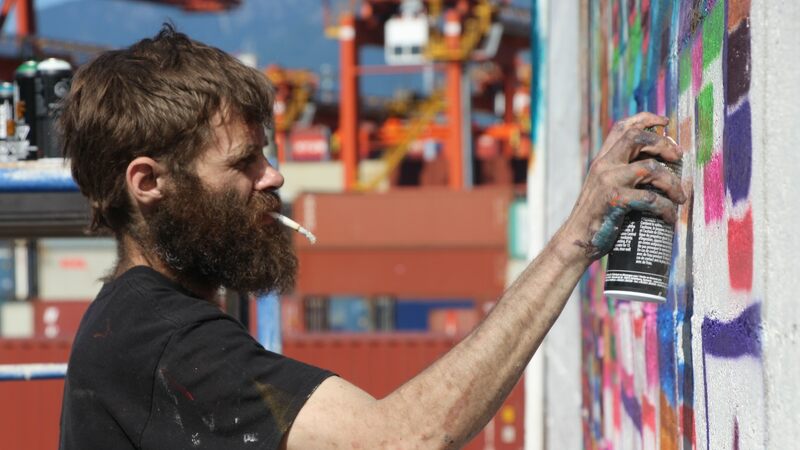 The movie is a fascinating study of a clearly troubled artist from Vancouver, Canada. Josh Laner (“Wastings & Pain”) directs this unflinching view of Ken Foster. Following Ken, as he sells his 30-minute paintings on the street and meets with would be buyers. The film follows his much-anticipated entries into art battles as the climax of the film. Like the film subject himself, the art battle sequences are equal parts hard to watch and mind-blowing. Ken is a homeless crack addict who has an uncanny resemblance to William H. Macy in SHAMELESS. He also happens to be a genius with a paintbrush. In fact, he’s pretty great without a brush we find out later in the film. The man is undeniably talented! KEN FOSTER is a hard documentary to watch but will hold you enrapt at the train wreck happening before you. We meet friends who buy his paintings and pay for his paints. Like most drug addicts he’s not very good at repaying the loans and kindness. Josh Laner does a great job of posing each of these friends the question, are they not funding his addiction by giving him money? Buying his paintings merely means he can buy more crack, which means he can do more paintings, which means he gets more crack. It’s a vicious cycle. We’re left to wonder how many of this man’s masterpieces he’s simply sold for a puff of the rock. He’s such a prolific artist that I wouldn’t be surprised if he has thousands of paintings out there. Josh Laner at one point asks Ken if he had to choose between doing art or crack which, would he choose. It’s a much tougher choice than it should be. So much so, we never really get a clear answer as Ken averts the question by mumbling. There’s a gorgeous animated sequence by Daniel Lyle Duncan that follows Ken in real time as searches for crack on the streets. This sequence is, again, hard to watch but uncomfortably funny. 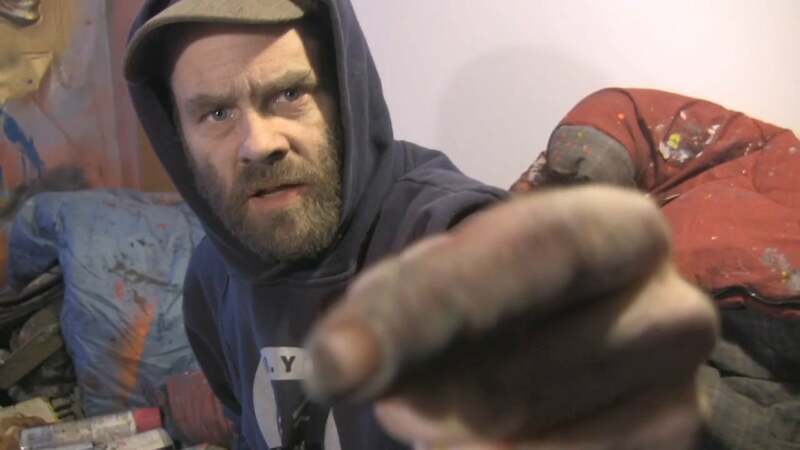 The man is literally in the middle of an art battle and uses the 10 minute break between painting to search the streets to appease his addiction. Ken is an undeniably talented artist. 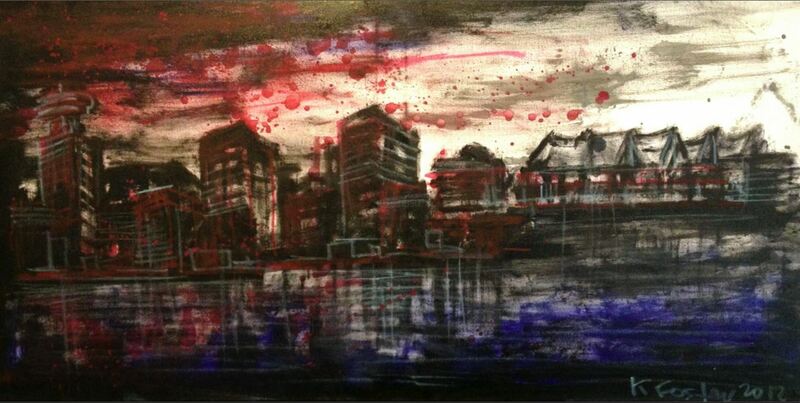 I won’t ruin the results of the art battle but I will say in the end it felt a little fishy. We learn late in the documentary that Ken has a daughter,Cypress, and we get to meet her. Meet her is a relative term as her piece is all done through webcam interview. It really clouds the emotional heft we should feel meeting Ken’s daughter. I couldn’t stop watching KEN FOSTER or take my eyes off the screen. 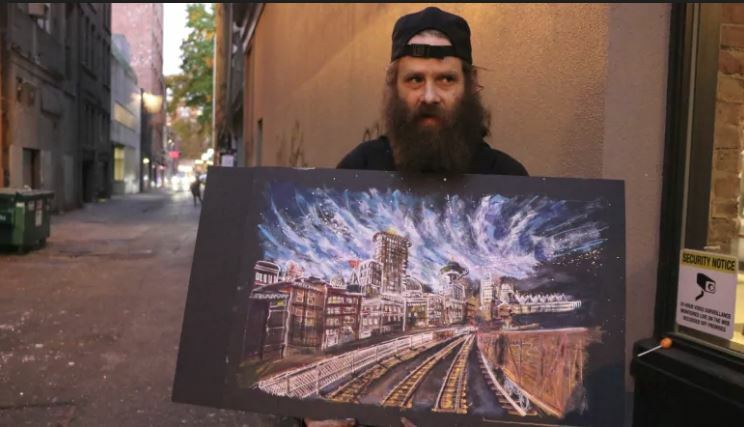 I’d never heard of the man before and now I can’t wait to visit Vancouver, In hopes of grabbing one of this man’s paintings. He’s an absolute genius and when you see what he can produce in 20 minutes you will understand his moniker as the Canadian Van Gogh. I think a lot of folks will have a hard time watching this film. It’s not happy material after all. 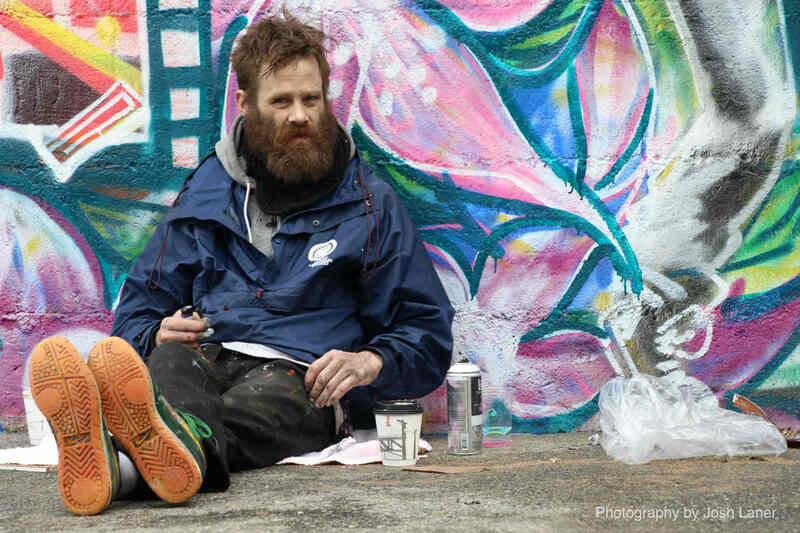 It also raises bigger questions on society and homelessness/addiction. Which I dig right into of course, but most prefer their Hollywood endings where everyone sits and eats turkey dinner together in the end. KEN FOSTER doesn’t end like that and much like the documentary itself, when it does stop you’re left uneasy and questioning many things. Even though it was rough material, I absolutely was absorbed in this documentary on Ken’s life. It’s a fascinating look into an addict’s life I absolutely recommend you seek out, if you can handle the subject matter.